This nice GUI will allow us to set up our dual monitor interface. I will say that the program can be quite fickle at times and sometimes it will not work even though it should work. Just keep trying with the options until you get a working combination. I wanted my second monitor, which happens to be a regular 15" CRT, to simply be an extension of my desktop. This is done using the TwinView configuration option as seen in the next photo. 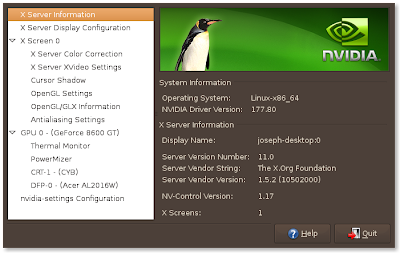 Once you get the right settings made make sure you click the Save to X Configuration File. If you don't click that then next time you start up all of your custom settings will be gone and you will have to play around with it again. Setting up the dual monitors was fairly quick for me. Took approx. 10 minutess of playing with various settings to get it to display just like I wanted it too. 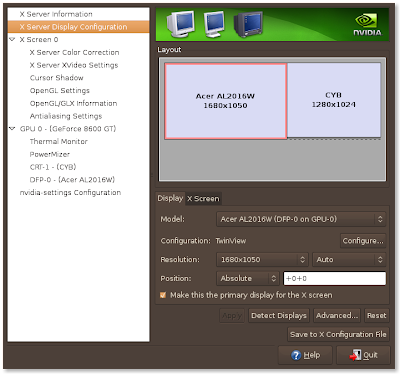 If you have an Nvidia card you should be able to set these up without too much hassle using similar options like I did. Of course if you want to do a separate X screen you could choose that as well instead of the TwinView.